Where do visitors go after using your internal site search? How quickly does site search lead visitors to conversion pages? Do specific search terms lead to unexpected pages, for better or worse? The answers are in your Google Analytics data, but not in the regular Site Search reports. Allow me to introduce Site Search Flow in Google Analytics: a way to use Visitors Flow for site search insight. In the regular Site Search reports, you get useful data like which search terms resulted in immediate exits and which terms kept visitors engaged or even led to conversions. 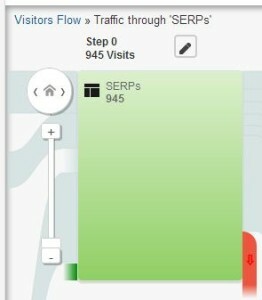 To see which pages visitors chose, go to the Visitors Flow report instead. You can create Site Search Flow in any GA profile that captures identifiable site search URLs in its Content reports. The basic idea is to define a set of URLs that contained your visitors’ site search results, so GA can build a flow diagram of the pages that came next – your visitors’ site search paths. Start by examining what URLs appear on your site search results pages. For example, LunaMetrics’ site search URLs look like this: /?s=xyz. However, they do not appear in every profile because in some profiles’ settings we strip the ?s=xyz part out of the URL, leaving just “/” in the Content reports. What do your site search URLs look like? And do your profile settings strip the URLs? Your site search URLs may look like something else such as /search/?term=xyz. In that case if your profile settings strip the URLs, then you’ll see only /search/ in your Content reports. Check the Site Content > All Pages report of your usual profile, and try to identify which URLs are site search URLs. Switch to an unfiltered profile if you do not see identifiable site search URLs in the Content report of your usual profile. In the screen shot below, I’m looking in my unfiltered profile at Site Content > All Pages and I’ve searched the table for ?s=. The resulting list of URLs confirms I’m in a profile I can use to create Site Search Flow. No unfiltered profile? Go make one right now. It’s a best practice to keep an unfiltered profile for troubleshooting or emergency backup data. Create a new profile and don’t apply any profile settings or filters – never change anything, just let it keep collecting data from now on. Of course a new profile only collects data starting on the day you create it. To use a brand new profile for Site Search Flow, you’ll have to wait a few days before proceeding to step two. Open the Visitors Flow report, the last report under Audience in the left navigation. Left-click any green node in the Starting pages column and select “Explore traffic through here”. If there is not enough data to create a flow diagram (and there are no nodes to click on), choose a longer date range. If you have so much data that the flow diagram is based on a very small data sample (you’ll see a yellow warning at the top right of the report), choose a shorter date range to increase the size of the sample. Click the pencil icon to define a Page Group according to the pattern of your site search URLs (SERPs). In my example I’m grouping all the URLs that begin with /?s=. I’m naming this page group “SERPs” i.e. search results pages for my internal site search. You can use regular expressions here, too. Just change the match type to “matches regexp” for more complex patterns of URLs. See our free e-book on regular expressions for Google Analytics for lots of practical tips and examples. Click apply to produce your Site Search Flow diagram! At Step 0 are the pages of results your visitors see after they search. At Step 1 visitors are either going to another page on your site, by clicking a search result or simply navigating to a new page, or they’re exiting the site completely. The red drop-off bars show where visitors left your site. All the great features of flow visualization are now at your fingertips, applied to your visitors’ search paths. In the screen shot above (click for a larger image), I’ve added steps on the right side of the flow diagram to see longer search paths. To add more steps, just drag the flow diagram over until you see the gray arrow and “+ Step” link. For example, I can see that lots of visitors at Step 1 go to the second page of search results (the node labeled /page/2/) and some of them continue to a third page of search results at Step 2. Other visitors at Step 1 go to blog posts from last July or August, or to our insanely popular blog post, the Ultimate Social Media Sizing Cheat Sheet. Keep in mind that, just as the node you defined represents one or more SERPs, the other nodes may also represent one or more pages. You may even see your SERPs node reappear in the search flow. Examine the group details to uncover data in nodes that aggregate several pages. Do any of your conversion pages appear in these nodes? How far do you have to extend the search path before any conversion pages appear? To analyze specific search terms, click the pencil at Step 0 and redefine the page group. Simply add a search term to what you already have, for example, I could change /?s= to /?s=funnel and create a node of SERPs for visitors who searched for terms beginning with “funnel”. Redefining the page group for a specific term lets you see whether unexpected pages appear in the search path. Are visitors finding pages you expect to be relevant or hoped they would find? If there are surprises, what kind of opportunities do they present? You can turn Visitors Flow into Site Search Flow even if you have not enabled site search tracking in GA’s profile settings, as long as you can identify site search URLs in Content reports. But if you haven’t enabled it, you should. Don’t just take my word for it. Some folks are downright evangelical about the value of site search data. What’s your favorite way to examine site search data? Have you tried using Site Search Flow and what insights did you gain? What obstacles still remain? Please share in the comments.